Bulgaria has very low external debt compared to other European countries. We have low unemployment rate, a stable financial system, a relatively sustainable government over the years and a profitable tax policy. Furthermore, Gross Domestic Product (GDP) growth is higher than the average for Europe. Bulgaria is one of the oldest European States with 20-century-old history and traditions. The country is also known for its picturesque nature and rich cultural heritage. Bulgaria has strategic geographical location – border of the European Union, intersection between Europe and Asia. The geographic location determines its role as a transit center and crossing point of the goods flow from east to west and from north to south directions. Bulgaria is a parliamentary republic, member of European Union since 2007 and NATO - since 2004. Our team of tax experts and highly skilled accountants will advise you on optimal personal and corporate issues including PIT, CIT, cross-border social securities, EU VAT etc.. We can offer you a tax effective solution and at the same time be compliant with the local legislation and on-going requirements. Send your question and we will be glad to answer you. The world of today is dominated by trends: economic, technological, political, internet or fashion. In an age of constant change no business can afford to take their eye off the ball. We at Leinonen understand this very well. Bulgaria, one of the most stable economies in the region during the present financial downturn, is the new trend: attracting more and more investors with its highly skilled work force, the lowest costs and taxes in Europe and unexploited business potential. With our international presence in eleven countries and our local experience with Bulgarian administrative, legislative and economic frameworks, we can take care of all the details while you drive the change. We are proud to announce Leinonen Bulgaria accounting, payroll and tax compliance services’ recertification under the latest edition of the international quality management standards ISO 9001:2015. The certificate was issued by Bureau Veritas on 25th of August 2016. 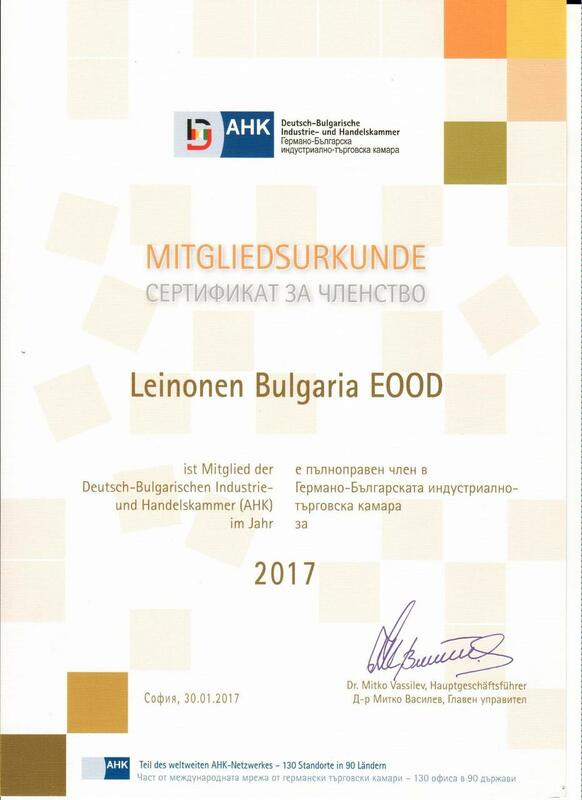 Thus Leinonen became one of the first certified under the new standards company in Bulgaria This certificate assures high quality standards of accounting and customer services that we are meeting in our activities. Read more. 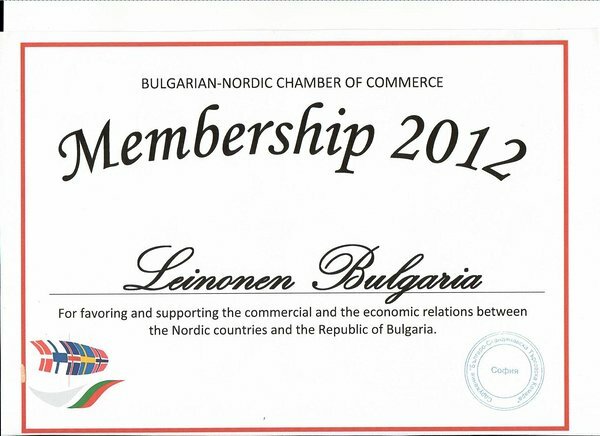 Participation in Bulgarian-Nordic Chamber of Commerce is naturally connected with Finnish origin of the company. Supporting and helping Nordic companies to enter Bulgarian market is key importance for Leinonen Bulgaria. As a member of specialized committee “Taxes” of German-Bulgarian Chamber of Commerce Leinonen Bulgaria provides its experience, advises and accounting services not only to German but to other foreign companies as well. 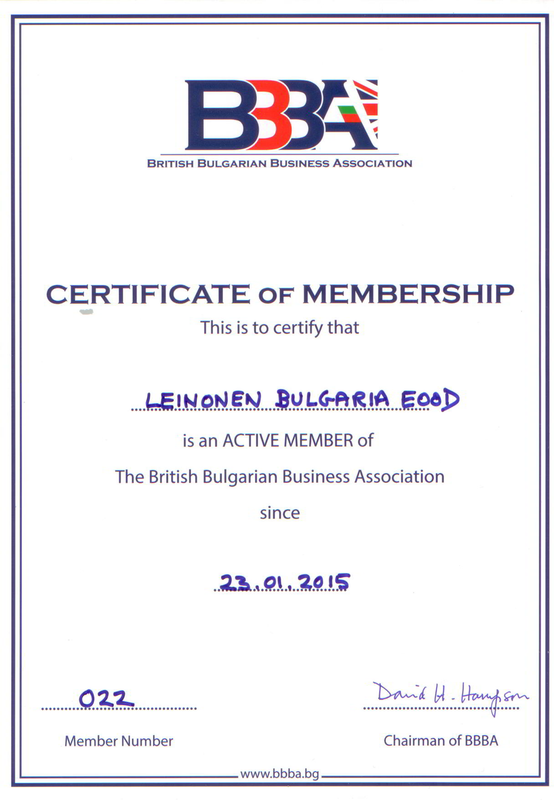 Since the beginning of 2015 Leinonen Bulgaria became a member of British Bulgarian Business Association. BBBA is the platform of choice to facilitate commercial activities between UK and Bulgaria. As a member, Leinonen Bulgaria aims to advise potential British companies and individuals on entry into the Bulgarian market. On 7th of November Leinonen Bulgaria launched its Advisory Unit on a specially organized seminar named “Social security entitlements of posted workers ”. The idea was to share Leinonen expertise in Coordination of applicable social security legislation in cross-border situations in EU Member States with business in Bulgaria.